It’s great to have them on the St. Clair Software team. If you use a localized version of DFX, drop the appropriate person an email and let him know how much you appreciate his efforts! Well, there were some remaining “gotchas” in 4.0.1 that I’ve ironed out in 4.0.2. Most important were the troubles that Default Folder X was having with Open and Save sheets in Carbon applications when the app’s windows contained a toolbar. These problems are now fixed, as are a couple of smaller issues. As always, thanks to everyone who reported the problems they found and helped test the fixes! Mac Recon gives Default Folder X a 10! In their Software Review :: Default Folder X 4, Mac Recon gives DFX 4 a 10 out of 10. They say it’s “a must-have piece of software for your Mac.” Thanks guys!! 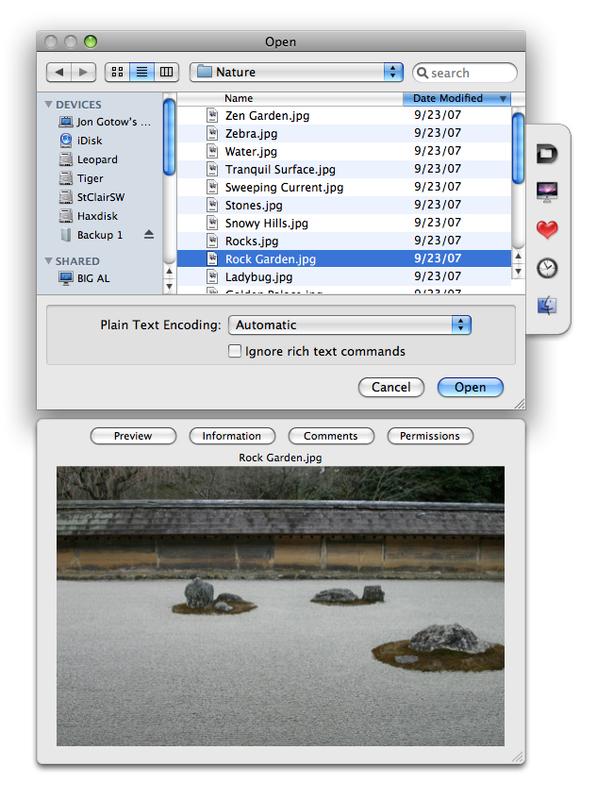 Ted Landau at MacFixit has posted a column celebrating Default Folder’s 20th anniversary. Ted’s a long-time Default Folder fan and one of the most knowledgeable guys around when it comes to troubleshooting Macs. It was a real honor to get to sit down with him for a virtual interview 🙂 And embarrassingly, I hadn’t actually realized that this year marks Default Folder’s 20th anniversary until Ted actually asked me when the first version shipped. We’ve gotta plan a party and a big sale or something! Default Folder X 4.0.1 is out! I just posted Default Folder X version 4.0.1. Thanks to everyone that provided feedback on the functionality and the UI, tested various fixes for me, and helped sort out a few of the truly funky circumstances surrounding a couple of issues. Another new beta with further fixes to the preview server, corrections for visual glitches with MS Office, and refinements to the new “retro” look. Details and a download linke are on the Default Folder X Beta Testing page. Here’s the latest iteration of the look – yes, those of you who missed the color icons, they’re back! OK, time for more geek-talk. I’ve spent a couple of late nights fussing with fat binaries, bundles, and mach-o architecture API’s to try and find a way to determine if an app is running in 64 bit mode. Surprisingly, I couldn’t just Google it and get an easy solution. I’ve posted a new beta version of DFX 4.0.1. Fixes include better compatibility with Mail.app, a correction for DFX’s hotkeys not working in the Finder, keyboard focus issues, and improvements to the new preview server for cases when images are corrupted (which used to cause the preview server to crash). Grab your copy from the Default Folder X Beta Testing page.